If you’ve ever had a middle school student in your world, you know what I mean. Like everything in life, the feelings are different for each of them, but if you’ve recently had someone pass through 6th, 7th, or 8th grade, you have undoubtedly been with them through some trying times. And that’s without factoring in the Cowden’s Syndrome. Middle School saw 7 surgeries in 3 years. 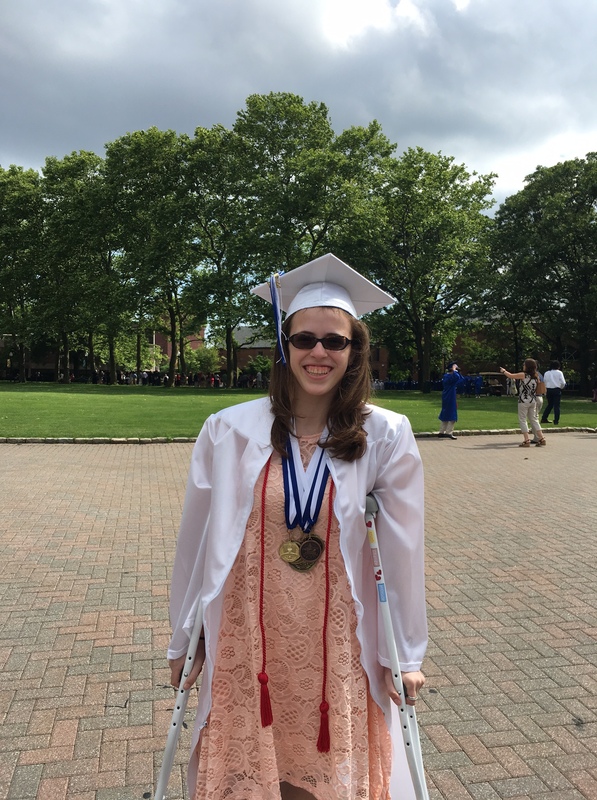 It started with a broken foot and ended with Graduation on crutches for some extreme, and as of yet, unexplained knee swelling. It also culminated with my girl as the Salutatorian of a class of close to 400. At awards night Tuesday she received several other awards as well. And, not a single one was connected in any way to the obstacles she overcame to get there. It was a proud moment. 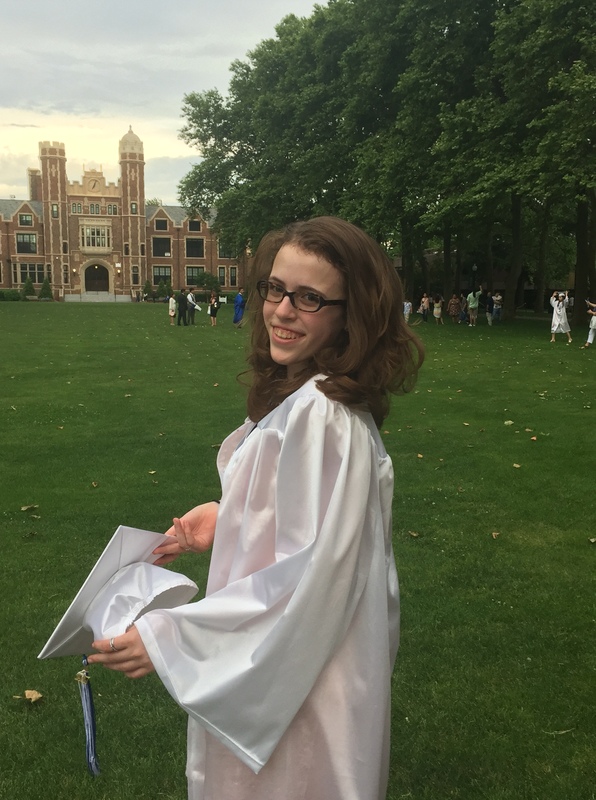 The desire of my teenager is to not ever be defined by her disease. She wants no pity. She’d love compassion. Empathy, not sympathy. She wants to achieve in spite of her obstacles and never BECAUSE of them. Her mind believes that she will continue to overcome. I have no doubt. High School is on the horizon, and while I have no idea what the next few years have in store, I am confident she will continue to achieve success in all she does. Cowden’s Syndrome messed with the wrong young lady. Welcome and good evening, Mr. Mele, the administration and teachers from IS51, parents, family and guests, and most importantly, the graduating class of 2017! As I stand here today getting ready for all of us to move on to high school, I’ll say Congratulations! We’re done! You might expect me to reminiscine about all the amazing memories I have of the last three years of middle school. While there were some good times, I’m not going to lie, middle school was three of the most difficult years of my life so far, and I’m sure I’m not the only one who shares that sentiment. Middle school is hard, and some times can be super taxing. In addition to figuring out the school, the teachers, and the classwork, we have had to figure out ourselves, and each other. Let’s be real here. Bullying is a real part of these years. Many of us have experienced it, and it hurts your self-esteem and diminishes your self worth. When people have hurt you enough, you can easily want to give up. Even if you can do it, your brain can become convinced you can’t. Therefore, you will fail. It’s cliché, but true. The body achieves what the mind believes. The first step to winning, to taking that final step into your full potential, is believing in yourself. That’s the trick. The way to overcome the feelings of loneliness and isolation is to alter and control your state of mind. Your state of mind, and hard work, together form the key to accomplish your goals. Now, while I’m here talking to you about a “winning state of mind.” I’d just like to put the disclaimer out there that I haven’t even close to succeeded in this mentality yet. But, I’m working on it. It’s hard. But, most things that are worth it are hard. I once had a friend tell me something at one of our swim meets that I’ll never forget. She said to me, “Stop. Breathe. Focus.” Since I respect her ability in our sport so much, I shut up, and listened. It was one of the best things I ever did and it worked. You see, I’m not talking to you about nonsense. As you head off into your high school, wherever it may be, you are likely to be at least a little nervous. Remember, that your mind is extremely complex, and it controls and affects more than we could ever realize. So, if you find yourself feeling like you’re not good enough. If you find yourself worrying too much about what others think of you, or if you find yourself feeling like you are destined to fail, remember to “Stop. Breathe. Focus.” You are enough just the way you are. And, don’t worry, I’ll be standing in the halls of Port trying to take my own advice. Thank you, and once again, congratulations to the graduates. Yes. It would be fine. And thank you. She’s working hard every day to be her best. Inspiration is as inspiration does!! Taking those 3 words with me as I start my new journey on Thursday…Stop Breathe Focus!! TY Meghan and Lori !! We are following along. Continue to keep us posted!